This PoC Military Reference Guide is intended to be a resource for military commanders and staffs who must consider PoC while conducting operations in PSO and MOAC contexts. Other interested readers may include international organizations, national militaries, training centers, and civilian and police officials who are also concerned with PoC. 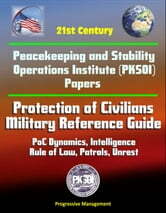 The PoC Military Reference Guide is primarily intended for military commanders and staffs who must consider the Protection of Civilians (PoC) during multidimensional Peace Support Operations (PSO) or Military Operations during Armed Conflict (MOAC), particularly when PoC is an operational or strategic objective. It is designed as a supplement to existing doctrine and other relevant guidance so that military forces can meet their obligations to ensure PoC. Other potential audiences are international organizations such as the United Nations, African Union, and NATO; national militaries; and the diverse members of the International Association of Peacekeeping Training Centres (IAPTC). This project is not meant to usurp processes that these institutions are undertaking to create their own internal guidance. Rather, the PoC Military Reference Guide can support doctrine development and training in global military institutions, and the authors encourage its modification so that other organizations can incorporate it as appropriate. 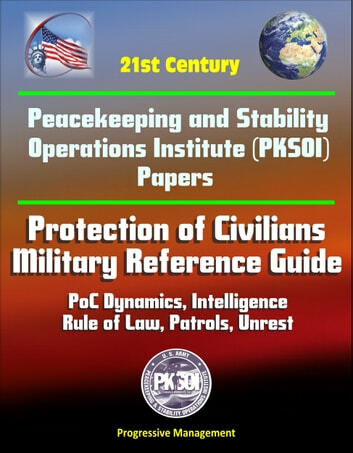 Finally, while the PoC Military Reference Guide focuses primarily on the military aspects of PoC, it recognizes that any military force will likely be one element of a larger multidimensional international mission that includes civilian and police components as well. Accordingly, the PoC Military Reference Guide may also be a useful reference for non-military PoC actors. Protection of Civilians (PoC) must be considered and integrated during all military operations, including Peace Support Operations (PSO) and Major Operations during Armed Conflict (MOAC). Civilians are protected persons under international law, and parties to a conflict have a legal obligation to protect civilians from the conflict's effects. Additionally, PoC is a major objective of many military operations and is frequently included in peace support mandates. There is, nevertheless, a lack of clarity and common understanding about PoC and how to achieve it. Many recent studies have noted that civilians are the people most at risk during armed conflict and peacekeeping operations have often not protected civilians effectively. These studies have identified numerous problems including inadequate mandates; a lack of applicable doctrine; differing views on what PoC includes; challenges in integrating the diverse set of military, police, and civilian actors required for PoC; and a lack of the necessary capabilities.